The basswood started blooming Monday, and Tuesday afternoon I walked over to see how much bee activity there was around that prime nectar source. "Wow, that's a lot more bees than I recall from previous years!" I thought to myself as the roar of bees washed over me. 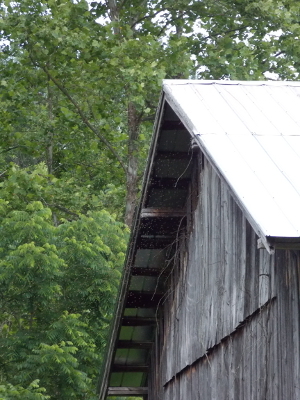 But then the bees literally passed over me and headed en masse toward the barn! Yes, we were finally being the recipient (rather than the donor) of a swarm! 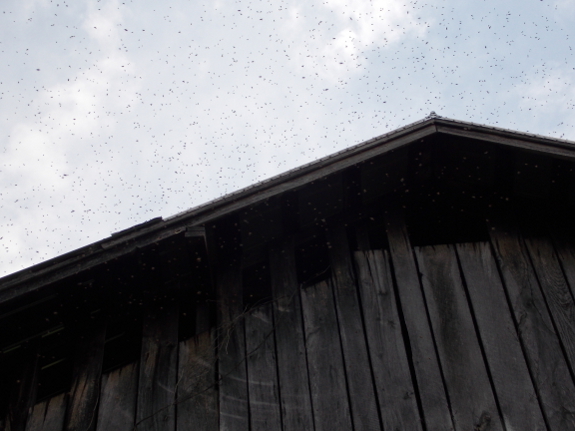 Anyway, back to Tuesday afternoon when the cloud of bees came from the southwest, flew low over the trailer, then ended up at their destination in front of the aeration holes just under the peak of the barn roof. 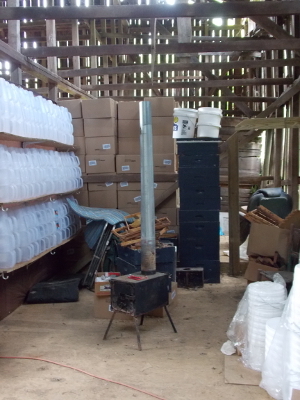 Soon, I could tell that the bees were working their way through the labyrinth of rafters and over to the six-foot-high stack of Langstroth equipment that has been sitting vacant in the barn ever since our last hives died two years ago and we moved over to Warre equipment. A gap between two carelessly-stacked boxes was large enough for the bees to move in, and within a couple of hours (spurred on by a short storm), the colony was entrenched in its new home. A breathless call to my beekeeping mentor later, I realized that I needed to see what the insides of those Langstroth boxes looked like if I was going to let the bees stay in them and just move the relevant boxes out into the yard as a new hive. My neglect had resulted in most of the wax in my old Langstroth boxes getting eaten up by wax moths, but I was able to cobble together a brood box full of partially- or fully-drawn comb with little moth damage. 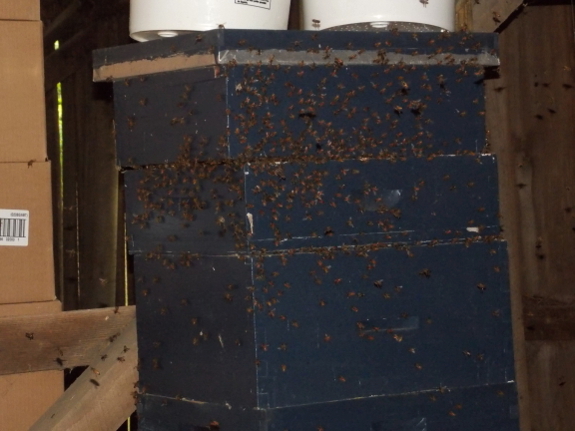 I started to assemble some good supers too, but it turned out the reason the bees had selected the boxes they had was because the two supers they were moving into had the best comb in the barn. There were three frames missing from one of the supers, though, so I'm glad I went through and filled that gap in before the bees could built wonky comb in the empty space. More on how we moved the hive to its permanent location in a later post. But, for now, I just want to end by mentioning that I'm 99% sure these bees didn't come from my hives, and instead sprang from the same location where the swarm I lost earlier ended up. I wonder if there's a beekeeper somewhere to the southwest who gained a swarm a few weeks ago and lost one yesterday? Our chicken waterer makes care of your backyard flock nearly as easy as managing a colony of bees. Mom is dying to know if you wore your suit. What I want to know is was this possibly the same hive that left you a couple weeks ago??? This is a great post! Grand to be a part of your excitement. Maggie --- I definitely wore my suit and even my bee gloves. Bees are very gentle in a swarm, but my hair seems to be a bee trap when they're in the air, and I can't help getting freaked out when a bee is stuck somewhere I can't see it, millimeters from my skull. To prevent the freakout, I suited up. This is almost definitely not the same swarm from a few weeks ago. 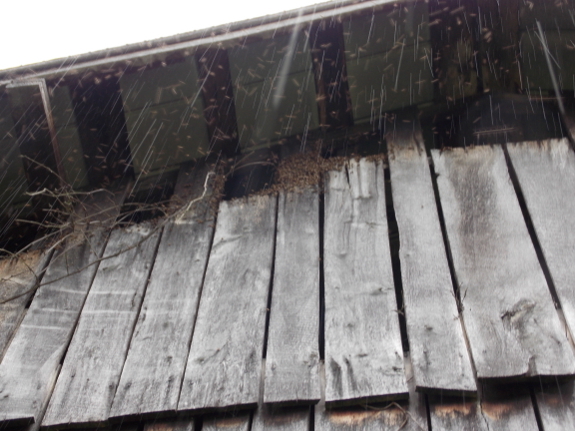 Unless they really hated the location they moved into, a swarm doesn't pick up and leave again. They might swarm again after building up and filling the space, but that's unlikely to happen the same year. Soooo awesome!!! Congrats on the new addition. I have been enjoying your blog for a couple of years now and always wanted to comment but never felt I could add to what had already been said, but this time I couldn't help myself! What an adventure you are having! To be able to witness (and understand what's happening) nature at it's best is awe-inspiring to me. Can't wait to hear more about your new colony. Anna I caught a swarm back around May 16th and had no problem moving it from a low hanging fruit tree to a NUC box. Enjoy your swarm! The old saying goes for beeks: A swarm in May - is worth a load of hay. A swarm in June - is worth a silver spoon. A swarm in July - isn't worth a fly. Free bees! ALWAYS a good thing. Can you make your own attractant?